The Chinese used to bind the feet of women to make them smaller. So tiny and fragile were their feet, in fact, that some women were left essentially crippled, barely able to walk. To the Chinese, this was a sign of beauty and social status. But to us it seems a cruel and bizarre practice. Unfortunately, the current social value placed on the thin body sometimes comes together with a person’s inner emotional conflicts, and the result may be an eating disorder. There are a number of reasons why a person may begin to starve herself. Some of us yearn desperately for social approval. And if we have the “right look,” we may feel that others will give us attention. We cling to the wrongheaded notion that other people will like us for how we look rather than for who we are on the inside. Or we may feel that we have no control over anything but our own bodies. We may not understand how effective it can be to assert ourselves in the world. Or we may want to avoid conflict since this has always brought us pain. Thus, we cultivate the idea that the only real control we have is to shape our own body. We may hate the idea of growing up ...which means looking and acting more adult. If we can stay a child forever, we don’t have to accept responsibilities or consequences in the adult world. And what better way to stay a child than to continue to look thin and young, the way a child looks. Or we may dislike how our bodies look. No matter how many pounds we lose, we may still feel that we look fat. We may not see our own bodies the way other people see us. Other people may see us as very thin, while we feel we could still lose a few more pounds. Or we may never have had the love we needed from the person who should have been there. So, you make yourself look right and the love may finally come. If you were heavy, you might think it would be hard to find love. These thoughts need to be examined in more depth – and that would be a reason to work with a trained therapist. 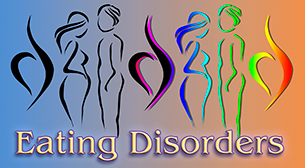 Eating disorders affect about half a million Americans at any given time, and they are far more common among middle-class and upper-middle-class females. Although there is growing evidence that eating disorders are a serious problem among males as well, 95 percent of those affected are young women between the ages of 12 and 25. People suffering from eating disorders have a very distorted image of their own bodies. They “feel fat,” even when they may suffer from extreme emaciation. They deny that they have a problem because of their intense fear of gaining weight. Without treatment for both the emotional and physical causes of their symptoms, those with eating disorders can suffer from physical problems that are potentially fatal. There are two primary categories of eating disorders: anorexia nervosa and bulimia nervosa. Anorexia is a disruption of normal eating habits in which the person intentionally tries to starve herself. The pattern typically starts during adolescence as a normal attempt to diet, but gradually leads to more and more weight loss. A person who weighs at least 15 percent less than the ideal weight for her age and height may be diagnosed as anorectic. There would be an intense preoccupation with food and body size, and this may also lead to compulsive exercise habits. Sometimes the victims of anorexia use laxatives and they may also force themselves to vomit. Over time, those with this disorder develop the symptoms of starvation. Menstrual cycles may stop, and there may be an associated loss of calcium from the bones. If the progression of the disorder becomes severe, the person may suffer from osteoporosis, low pulse and blood pressure, anemia, swollen joints, an irregular heartbeat, and sometimes heart failure. In addition, victims of anorexia can suffer from lethargy, loss of interest, feelings of hopelessness and worthlessness, and other symptoms of depression that may actually discourage them from seeking the treatment they so desperately need. People with anorexia tend to be perfectionists. They often suffer from low self-esteem and are very critical of themselves and how they look. Anorexia has a particularly tragic quality because its victims are often those who were “model children.” They are good students, athletes, intelligent, obedient, highly responsible, and they often want to please others. They usually are people who keep their feelings to themselves. Their families often have high expectations. The victims of anorexia have low self-esteem, problems with assertiveness, and a tendency toward depression. Bulimia is a cycle of uncontrolled binge eating followed by purging through vomiting and the use of laxatives. People with bulimia are often of normal weight or even somewhat overweight. They repeatedly diet and vigorously exercise. They differ from those with anorexia in that they frequently have severe eating binges, which for diagnostic purposes happen at least twice a week for at least three months in a row. Sometimes those with bulimia engage in purging several times a day. Often this remains a disorder hidden from family members and friends since there is not a significant amount of weight loss, and many times the problem goes undetected and untreated until the person is in her thirties or forties. 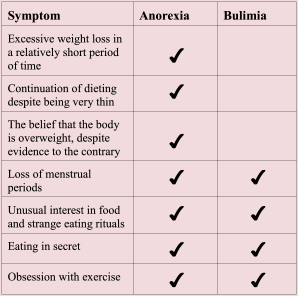 Bulimia is two to three times more common than anorexia. There are severe physical complications which can accompany the binge-purge cycle. Tooth enamel exposed to stomach acid may wear off and the teeth can decay badly. Associated problems with hypoglycemia, mineral depletion, kidney disorders, irregular heart beat, and ruptures of the stomach and esophagus are potentially life-threatening. 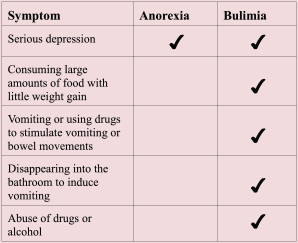 Although people with bulimia share many of the personality characteristics of those with anorexia, they tend to be more impulsive, anxious, gregarious, and at a statistically higher risk for alcohol or drug abuse. Eating disorders illustrate the close connection between emotional and physical wellness. The emotional disorders of anorexia and bulimia lead directly to physical problems, which in turn can worsen the person’s emotional state. Simply gaining weight or ending the binge-purge cycle does not address the underlying emotional problems which caused the eating disorder in the first place. Both the physical symptoms and the emotional causes must be addressed during treatment. Although some people may be in very serious condition so that temporary hospitalization could be required, many can be treated successfully on an outpatient basis. Treatment plans must always be individualized to take into account the person’s own special combination of circumstances. An effective treatment plan may include a combination of medical intervention (such as a physical examination and possibly antidepressant medication if depression is a problem), nutritional counseling (to begin to rebuild physical health and establish healthy eating patterns), as well as intensive psychotherapy. An important first step in overcoming an eating disorder is for the person to “come out,” or to acknowledge to oneself and in front of other people, that one’s pattern of eating is a problem. This is a difficult first step in the therapy process, and the person who first enters therapy may feel that they could never do this. But it is something to be worked on. And in the hands of a compassionate and understanding therapist, it may become a possibility. Psychotherapy helps a person to understand the feelings that trigger eating disorders, correct distorted self-image issues, overcome fears of weight gain, change obsessive thoughts and compulsive behaviors related to eating, and learn appropriate eating patterns. Through cognitive behavioral therapy a person can learn to recognize feelings such as anxiety or depression that can trigger abnormal eating behaviors. Then the person can learn new responses to these feelings. Psychotherapy can also help a victim of an eating disorder to develop a new sense of self-confidence and self-esteem regarding their abilities that are not related to appearance. Sometimes the entire family may benefit from therapy. Family members can gain a new understanding of their relationships and learn how to offer emotional support in healthier ways. Family therapy can also help the victim of anorexia or bulimia to develop a new sense of individuality which is crucial to a healthy self-image. The rewards of finding a therapist and coming to terms with a difficult pattern far outweigh the habit of holding on to a pattern that remains hidden and a way of dealing with the world that is no longer useful. It’s probably time for real health and a beautiful future. Eating Disorders affect people who are intelligent, caring, compassionate and responsible. Treatment through therapy aims to preserve the person’s dignity and to help the person live up to his or her maximum potential in life. If you or someone you know suffers from an eating disorder, please understand the seriousness of this problem. Take the positive first step of calling to make an appointment.